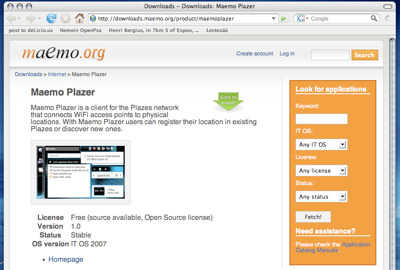 This is why I’m very happy to see that Maemo Mapper can now be used with OpenStreetMap tiles. OpenStreetMap is a volunteer project for creating truly free street maps and other geographic data. Maemo Mapper has a useful feature called “Points of Interest” that can be used for marking and navigating to spots on the map. To add touristic capabilities to this feature I created a quick Python script for populating the POI database with Positioned Wikipedia pages near you. 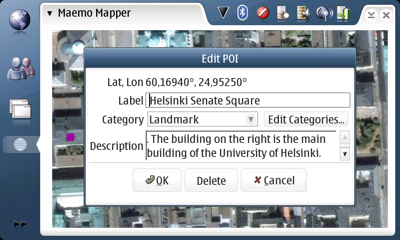 It uses GeoClue for determining where the user is located, and then pulls nearby pages using the Geonames web service. If you want to try it, read my Internet Tablet Talk post. 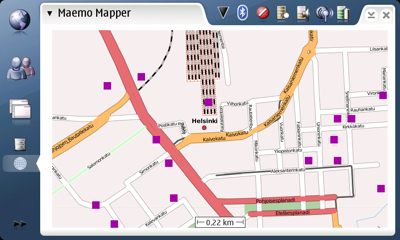 Updated 14:33: Switched the OpenStreetMap tile source from Osmarender to Mapnik since the maps look nicer this way. I think it is also appropriate to note that OpenStreetMap can already produce better maps for some places than Google Maps does. 12 February 2007. 1 minute read. 20 November 2006. 1 minute read.